Please the whole table with these delicious Taco Bowls. 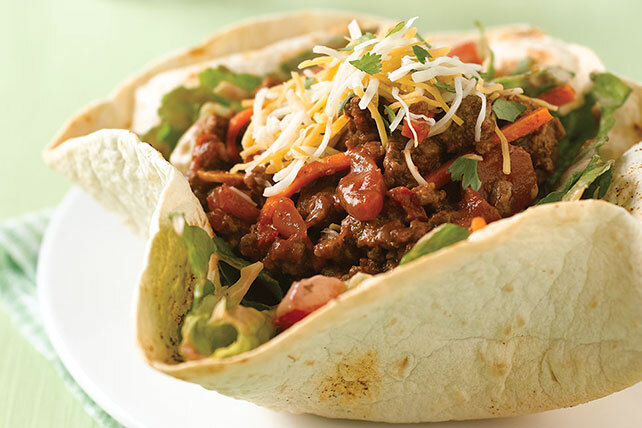 Family and friends will love the meaty, cheesy flavor of these easy-to-make Taco Bowls. Meanwhile, brown meat with carrots and remaining chili powder in large nonstick skillet on medium-high heat, stirring occasionally. Add 1/2 cup salsa; cook and stir 2 min. or until heated through. Mix mayo and remaining salsa in large bowl. Add salad greens and tomatoes; mix lightly. Spoon into tortilla shells; top with meat mixture, cheese and cilantro. Cook ground beef thoroughly and evenly. The color of the raw ground meat can vary from bright red to light pink. Do not rely on the color of the meat to check for doneness but use an instant read thermometer instead. Ground beef should be cooked to an internal temperature of 160ºF.